When you sign up to be an apprentice at Rootdown, don’t expect Sarah and Simone to go easy on you in your first week! 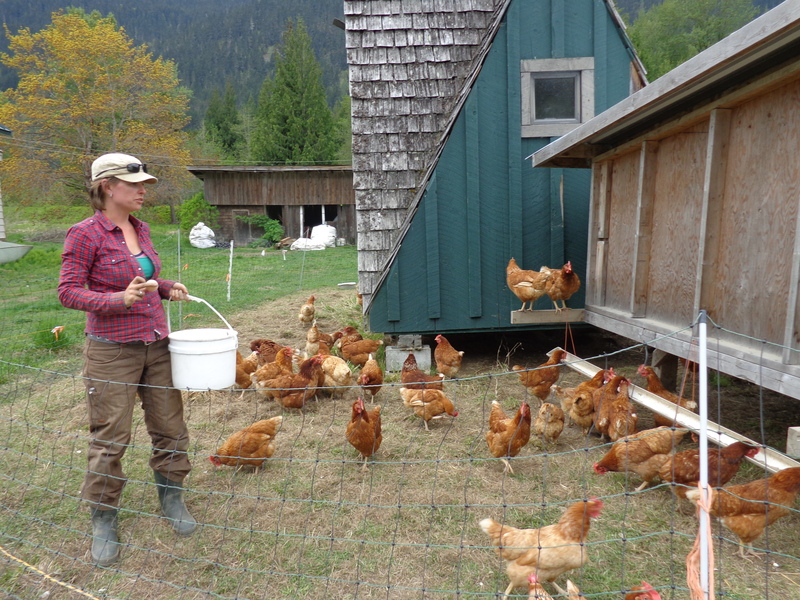 Our second day on the farm, and we were ankle-deep in straw and chicken manure, shoveling out the winter chicken coop. The smell was enough to send us outside for breaths of fresh air regularly, and our backs were worn out at the end of the day, but we still came out smiling and, 3 weeks later, we’re still here! 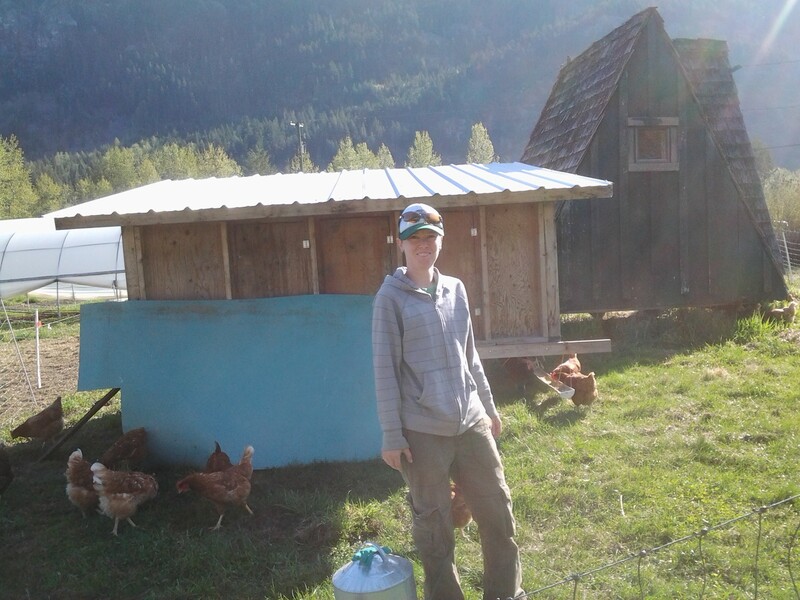 My name is Karly, and my partner Marcy and I are Rootdown’s apprentice farmers for the 2014 season. 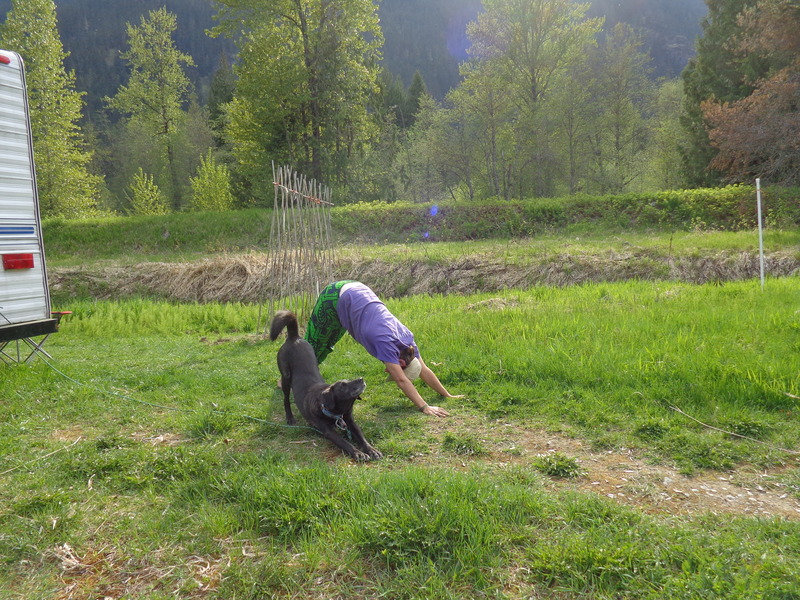 We arrived here from Vancouver at the beginning of May to learn the ropes of small-scale mixed organic farming with Simone and Sarah. I come from having completed the UBC Farm Practicum in Sustainable Agriculture last summer, and am eager to see how much of what I learned will be applicable here – already, I notice that a lot of the skills I gained are going to be useful, but there are a lot of differences between a 20-acre university-based farm with an army of staff, volunteers, interns and students, and the 2 or so acres of vegetables, 45 chickens and soon 20 pigs of Rootdown. Marcy hails originally from northern Alberta, so grew up around gardening and farming, but most recently came from a job as a program manager at UBC. We’re making ourselves at home in the trailer parked at the farm, and are found out in the fields 5 days a week. The weather so far has been amazing – being from Vancouver, I’m not used to so much sunshine in May. We’ve spent lots of our time so far transplanting things like broccoli, cauliflower, cabbage, lettuce and squash, seeding other vegetables, setting up the tomatoes and basil in the greenhouses, and becoming good friends with Rootdown’s three farm dogs. So far, we’ve been learning a lot and getting our hands very dirty. Marcy finds great satisfaction in solving irrigation puzzles, and I like the satisfying work of transplanting and am excited to learn more about animal care. You’ll see both of our smiling faces at the Whistler market this season, so come say hi! ← welcome spring! 2014 Harvest Box Program Open!